Majority of the reviewers are highly satisfied with their acquisition. Despite owning several pairs of Vans sneakers, one remarked this as the best shoe that the brand has ever made. A high percentage of purchasers described these as lightweight. Many received compliments from wearing the Vans UltraRange Hi MTE. One said that these are not only the most comfortable Vans in his opinion, but it is also the most comfortable shoe among all brands. Several noted that the UltraRange Hi MTE did not need breaking in. One who is an MTE fan mentioned that these are an excellent addition to the already fantastic range. The material used on the upper feels great on the feet. Because of the tough construction of the toe area, one can do several activities with it like hiking but still feel comfortable because of its soft heel. A great number of reviewers were able to use these for different kinds of surroundings—mud, rain, rocks, wet grass, etc. Despite this, it was able to hold up its shape, protect the feet, and help it be dry and warm. A couple of buyers highly appreciate the all-weather feature of these shoes. One of those buyers felt disappointed that after only a few wears, the shoe already separated from the sole. For a brand that has been strongly linked with skateboarding shoes, it is a breath of fresh air to see that the brand's expansion regarding innovation and design. Offered at $95, these sneakers are well-worth the purchase as it can transition through different seasons and terrains. Infused with numerous technologies, these sneakers are comfortable, flexible, and lightweight. All this, clad in a stylish bootie-construction exemplifies that design and function can mesh well and not compromise one or the other. It was the 16th of March 1966 when brothers Paul and Jim Van Doren and business partners Serge Delia and Gordon Lee launched their company and first Vans store named the Vans Doren Rubber Company. Initially, the brand only offered three styles of shoes ranging from $2.49 – $4.99. Aside from this, it also provided a unique customizable feature wherein customers can state their preferred details and avail of the shoe that afternoon. Because of its innovation of injecting its now signature Waffle outsole, and the use of durable materials, the brand became appealing to a new set of market, the skateboarders. Although the brand has found its niche on that category, it also expanded on different extreme sports. Currently, the brand delivers apparel and footwear for extreme sports like skateboarding, hiking, and surfing. It influenced the brand to also innovate their designs. One of their releases is the UltraRange, pioneers the road to innovation by incorporating lightweight traction, excellent mobility, and supreme comfort. The collection combines function and design to overcome different conditions. Although the outdoors was a great factor upon the conceptualization of this shoe, the style of the Vans UltraRange Hi MTE remains to be versatile and not only exclusive to outdoor-wear. The use of different materials on the upper sealed with a clean aesthetic exudes a laidback but mature feel. The high-top silhouette and MTE detailing that it comes with ensure that it can be taken on different seasons, activities, and occasions. As a tribute to the heritage design of the brand, these sneakers are clad with the iconic Sidestipe, keeping the branding on the other part of the shoe minimal. These boot-like but athletic-inspired shoes can be dressed up by pairing it with trousers or dark-washed jeans or can be dressed down with shorts or joggers. Coming in three colorways—ginger, pewter, and black, users will find it uncomplicated to style these shoes. Being designed as an all-weather sneaker, the high-top construction of the Vans UltraRange Hi MTE comes in useful because of the extra support it provides. Utilizing different elements like suede, nylon, and leather, along with sock-like construction supplies a secure fit, whatever the activity may be. Offered exclusively for men, these sneakers are offered in sizes measuring from 6.5-13. Basing on the feedback of those who purchased, these sneakers fit true to size. The traditional lace-up closure that goes all the way up to the ankle allows its users to customize that tightness of the shoe. The Vans UltraRange Hi MTE belongs to the best of both worlds—the Ultra Range and Vans' Mountain Edition. As part of the UltraRange line, it possesses the brand's first co-molded midsole, combining UltraCush Lite foam and rubber, similar to the signature Waffle Outsole. This heightens the comfort and reduces the weight of the shoe. The insides are also infused with a technology called LuxLiner, which offers seamless comfort by eliminates the rubbing of feet, especially on hotspots. Included in the Mountain Edition (hence, the term MTE), it includes details like warm linings and a water-resistant finishing to accommodate different and extreme weather conditions. 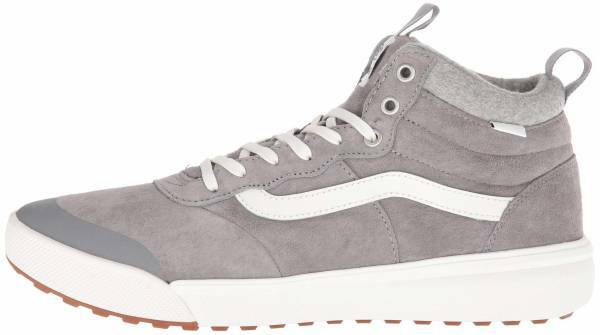 The Vans UltraRange Hi MTE holds a reverse waffle lug to deliver maximum traction and grip. The Rapidweld constructions heighten the shoe's flexibility and reduce pressure points.